A checklist is a way of keeping track of subtasks within a card. You can add multiple checklists to a single card. Add Checklists via the "Add Checklist" button in the "Add" section of the card back. Enter a title (or use the default "Checklist"), then click 'Add'. Add a checklist from the card back. Add new checklist items via the "Add checklist item" input in a checklist. Mark an item as complete or incomplete by clicking the checkbox to the left of the title. Rename a checklist or checklist item by clicking the title, changing the text, and clicking save. 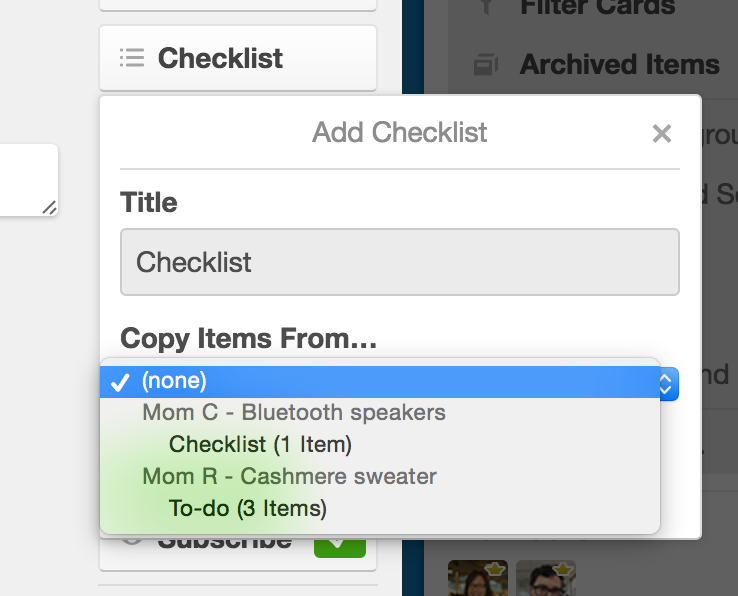 You can reorder a checklist item by dragging. Add items, check off completed items, rename your checklist and items, and drag and drop items. You can also mention a board member or add emoji to a checklist item when adding or editing a checklist item by clicking on the corresponding icon on the right-hand side. @ mention or add emoji to your checklist items. Delete a checklist you no longer need by clicking "Delete..." to the right of the checklist name. Delete a checklist item by clicking the item to edit it, and then hitting the "Delete" and "Enter" key on your keyboard. Alternatively, select "Delete" from the item actions menu. Delete a checklist or checklist items. Complete individual checklist items by checking them off via the checkbox at the start of the line. Once all checklist items have been completed, you'll the progress bar turn green and the checklist badge on the front of the card will also turn green. Complete individual checklist items on the card back. The checklist badge turns green once all items have been completed. Copy the items from another checklist on your board to a new checklist by selecting the checklist you wish to copy from the "Copy Items From..." drop down menu in "Add Checklist." Easily copy checklist items from another checklist. You can easily import items from a list (or a spreadsheet) to a checklist as long as each item is on a separate line. Copy the list items and paste them in to the "Add item" field in your checklist and press 'enter.' A separate checklist item will be created for each listed item. Import lists as checklist items. You can also turn a checklist item into a card by clicking the item and selecting "Convert to Card" in the item actions menu. It removes the item and creates a card with the title of the item beneath the current card. Turn a checklist item into a card. You can also click and drag to re-order checklists and checklist items. 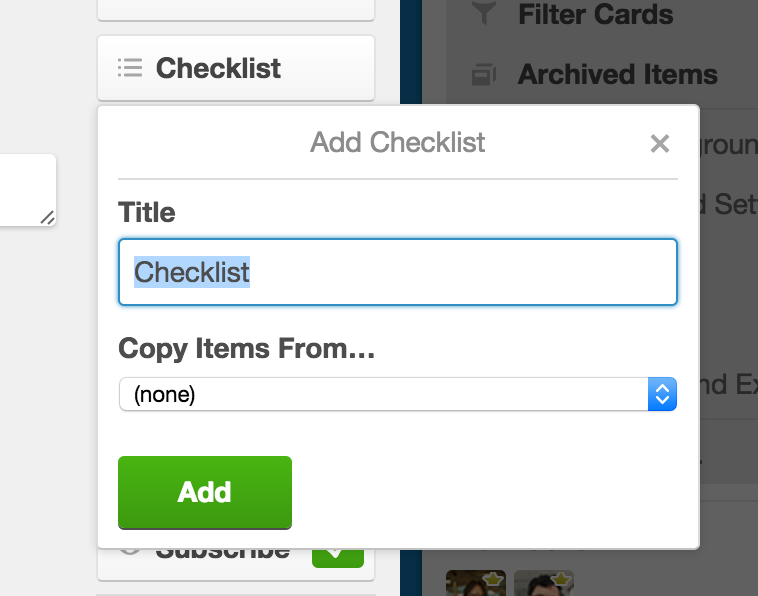 Click and drag to change the order of your checklists, or to move a checklist item from one list to another.